Trim the florets from your broccoli crowns, cut as close to the floret as possible so they come out small and not large. If you have some big florets, cut them into smaller pieces. Put them on a sheet pan and sprinkle with seasonings and drizzle the olive oil. 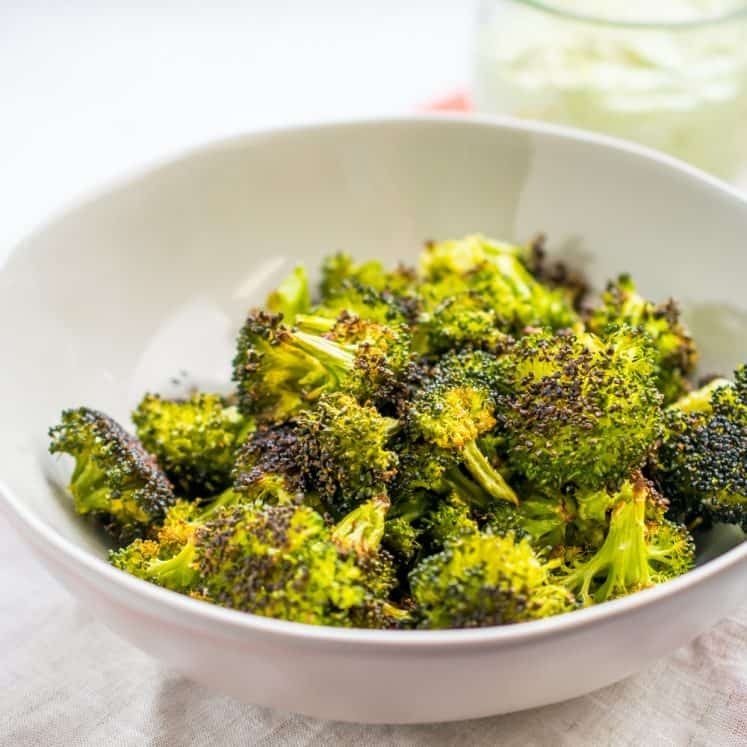 Use your hands to toss and massage the broccoli florets until the seasonings and oil are evenly incorporated all over the florets. Spread them out evenly over the sheet pan so they’re not very crowded. Turn your florets tree side down. This will up the crispy factor. Place them in the oven, then turn the oven on to 400F. Set a timer for 30 minutes. At the 30-minute mark, turn the oven off and leave the broccoli in there an additional 5 minutes. Remove from the oven, let cool. Serve with cilantro aioli. Other delicious seasoning ideas: ground ginger and mustard powder, cumin and citrus zest, sesame seeds and garlic, minced garlic, and mustard seeds… the possibilities are endless!